WordPress is a CMS and everyday it keeps on expanding its functionality and features through plugins or new versions like the recently released WordPress 3.1. These plugins are really useful in adding new functionality to the existing site. Who knows that adding a new feature in your website is so easy. Thanks to the add new plugins feature of WordPress. WORD to PDF converter is a plugin which you as a Admin, can install in your WordPress site, and give your visitors a unique functionality to convert any Word file to PDF. Yes, this is one of its kind plugin. 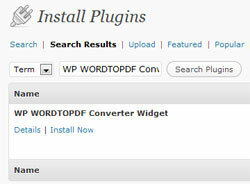 From the settings, click on WP WORDTOPDF Converter Widget and from here, you can configure the options. Global skin: Select the skin for your widget from here. You can also create one, if you are proficient in CSS. Max file size: Select maximum file size limit. E.g. if you want that your visitors should only upload files of less than 1 MB, then enter 1 in this field. Now go to Widgets and insert the WP WORDTOPDF Converter Widget anywhere you wish. Sidebar or footer area seems to be a good choice. But you can insert it anywhere, as its just a widget. This is how your widget will look like in front end. All they need to do so to just click on Browse button and upload the Word document. As soon as the conversion process is done, they will get an option to save that PDF. Your user can just click on Save and there you go. This WordPress plugin just converted Word to PDF file. The uploaded files are stored in plugins directory and are cleaned everyday using a cron job. You can also download Word to PDF plugin if you don’t want to install it from Add New plugins section. So what do you think about this plugin, is it useful ? What’s your thought on this one, do comment below.